People today have such busy lifestyles that time spent together with other family members has become more precious than ever. Mr. and Mrs. Stone’s biggest concern when arranging the interior decoration of their new home was to have a natural, open feel that would provide inspiration for their children’s creative activities, while at the same time bringing family members closer together. Whereas the layout of most family homes gives pride of place to the living room or lounge, Mr. and Mrs. Stone and Ivan, the interior designer have come up with an alternative approach. In the initial stages of the interior design process, Mr. and Mrs. Stone decided that they wanted the provision of space for their children’s activities to be the main consideration in the design, so that their children could play happily and study in a relaxed environment; the parents also wanted to be present for every moment in their kids’ childhood when they were not busy working. After extensive discussions, the idea of creating a “reading and play area” gradually took shape. The Stone family are very open-minded, liberal and nature-oriented. Both Mr. and Mrs. Stone enjoy gardening, and the Waldorf Kindergarten that their daughter attends encourages the children to collect twigs, leaves and seeds that they use to make craft items, or to decorate the dinner table to create a seasonal effect. When you enter the Stone family residence, the visitor is greeted not by a living room but by a 19-ping (approximately 60m2) leisure and recreation area. A smooth wooden table sets the tone; this is the creative space where Mr. and Mrs. Stone spend a lot of their time with their children making things together. The “Favourite Thing” light fixture that is hung from the ceiling combines lighting and display functions; the craft items created by their daughter can be placed inside the light cover for backlit display. The blackboard-wall that is positioned on the right-hand side as one enters the room serves as a message board for all the family, and provides the children with a surface to sketch on; Mrs. Stone also uses the blackboard for noting down recipes on. The interior design thus provides the family with a flexible, interactive space. 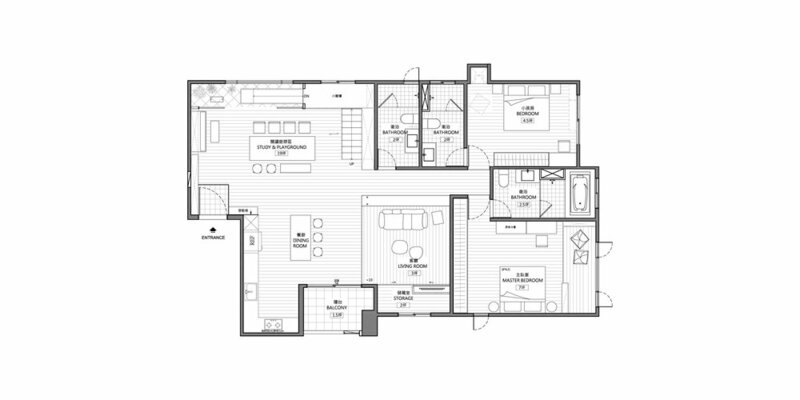 The kitchen with its central island is a transitional area between the house’s public and private spaces. 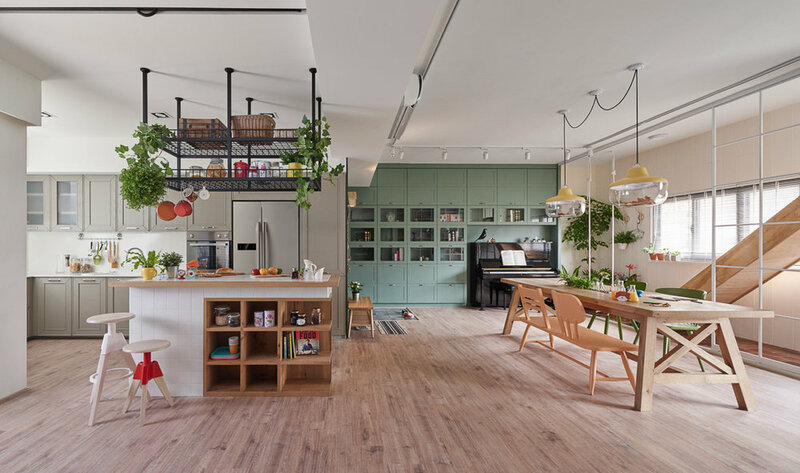 In several places, dots are cunningly used to “direct” movement between the leisure and recreation area and the compact kitchen. Carefully designed storage spaces around the four sides of the central island make it easy for Mrs. Stone to access herbs and spices, cookery books etc. whenever she needs them, so that she can prepare a wide range of delicious foods for the family. The “latticework” style design of the cabinets matches the shape of the bookshelves in the house. Above the central island, the interior design makes effective use of the high ceiling to incorporate black steel storage racks with an “industrial” feel, which function as a visual focus of attention in the kitchen area; these racks can also be used to hold plants, so that greenery extends from the veranda through with the green colour tones of the cabinets in the reading area right into the kitchen. The kitchen area thus has everything needed for the family’s happiness, and provides a marvelous venue for the members of the family to get together while enjoying their meals. The slide in the Stone family’s home is the little girl’s own special space. The moveable slide is built using mortice and tenon construction so that it can be disassembled and reassembled easily; this means that, when the slide is not needed, it can be taken apart and put away, increasing the amount of space available on the veranda. The swing on the veranda, in combination with the potted plants that are scattered around the veranda, makes for a particularly beautiful spatial arrangement. After coming home from work, Mr. Stone can sit on the swing watching his wife and daughter playing the piano together inside the house, and thinking to himself that his vision of the ideal home and family life has come true.